Rain's Garden: Whoa Is Me! 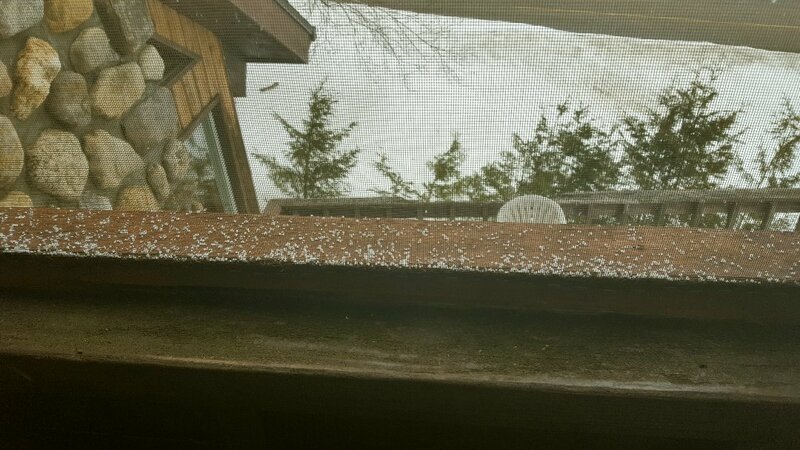 More Snow!! I'm having egg issues too...not like other homesteaders who are gathering so many fresh eggs that they don't know what to do with them!!! But I think I may have overbought...yes, I did! I've already frozen a few dozen and I still have two more than need to be eaten in the next two weeks, so I'll be baking a lot and making egg dishes. 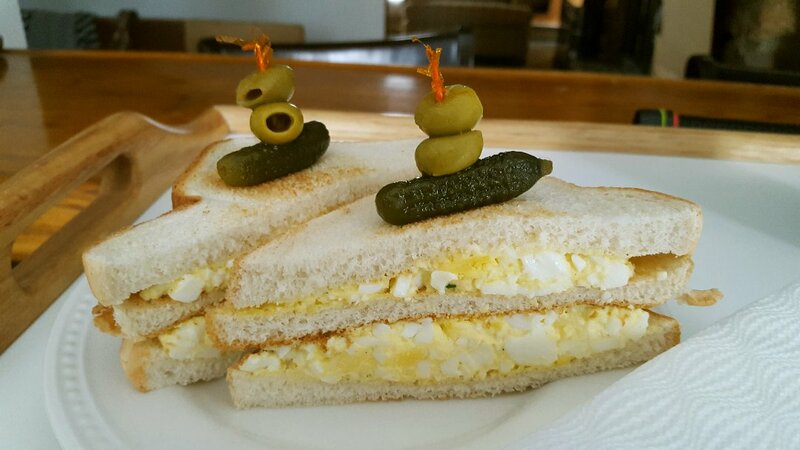 I made a double-decker egg salad sandwich for Alex's lunch yesterday. I forgot to take a picture, but I made myself an egg white scramble with tomatoes and Parm. 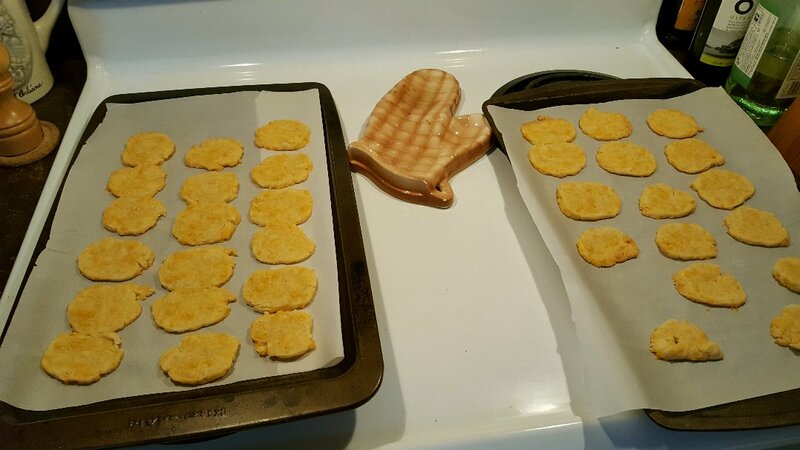 No dinner pics today, we had the leftover Crunchwraps! I got my book order yesterday! :) I've already started reading the Anti-Anxiety book and there is a LOT in there...my gosh. It might take me reading it a few times over to process all of the food information relating to different conditions of the mind. I also got this new gardening book. It's so much easier to read than Eliot Coleman's "Four Season Harvest" which I have to admit, I'm having a hard time getting through right now...but that could be that my mind is focusing on healing the anxiety. 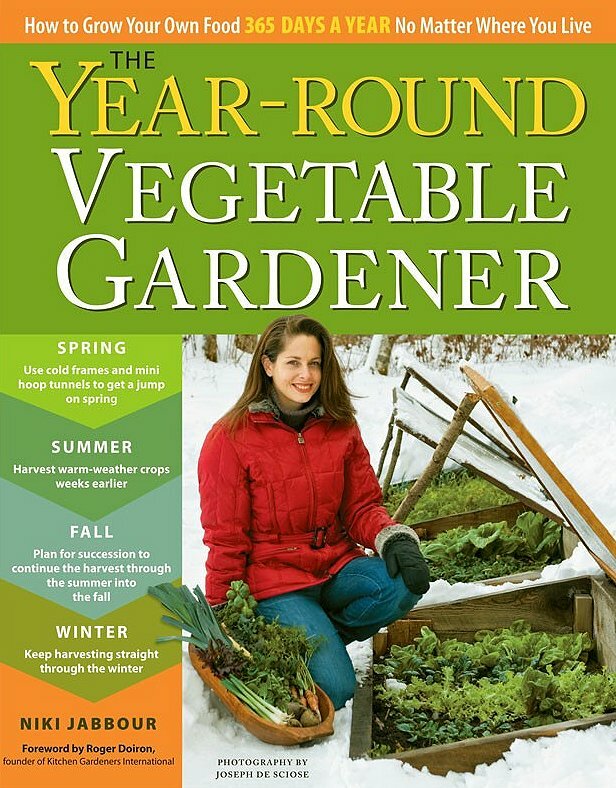 The author of this new book, Niki Jabbour, is from Halifax, so she's a Canuck and she writes very well, lots of explanations of each crop and how it relates to each season for the garden. I browsed through it last night and can't wait to get more into it! I'll still read Eliot Coleman's, it'll give me a few different perspectives and suggestions. Anyone up for a baking challenge this weekend? After my horror story about the burned Cheese Nips in yesterday's post, Sam I Am mentioned that there has to be a way to make them at home; and I found a recipe that I did actually use once: Homemade Cheeze-Its. I looked back at my photos and I made them last November. 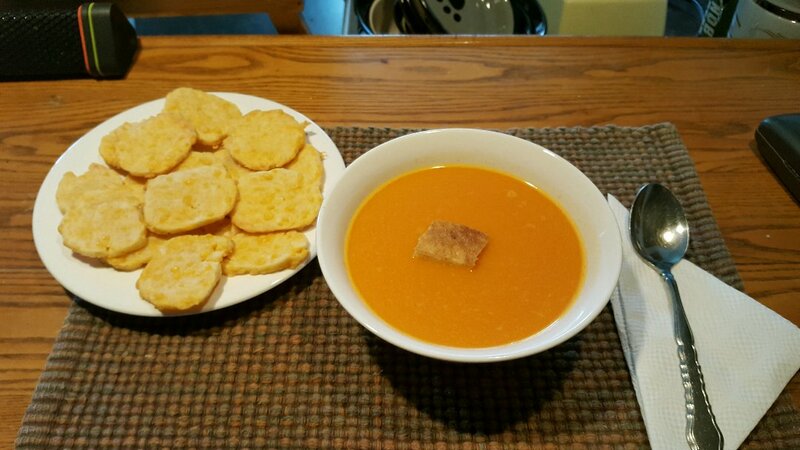 I served them with homemade tomato soup and I couldn't remember why I didn't make them again. Alex thinks it's because they were really "flour-y", which makes sense because I kind of remember the dough being very sticky so I might have used more flour in the rolling and cutting. Plus I didn't have cookie cutters back then, just my dog bone-shaped ones...I have more now though so I can make them smaller. If you look at the website though, hers look perfect...I don't know that I can achieve that! But I'm up for the challenge. I have some Cheddar that ain't doin' nothin' so I'm going to do this sometime over the next four days! I made egg salad sandwiches for lunch yesterday, too! Have just a little bit to finish up tonight. We had our "big" meal at noon today -- Stuff Green Peppers -- so we'll have the left over egg salad, maybe on bread, maybe just on lettuce, for dinner tonight. I also made a Strawberry Shortcake this morning and I have a feeling we'll round off our scant dinner with a piece of that, too. A baking challenge this weekend? What are the "rules" you had in mind?? Cheddar that ain't doin' nothin'? Say it ain't so! It was 70 here today but down in the 50s tomorrow. Sorry you got snow but it will warm before long! Great food again, do you make snow cones? I am not a huge egg fan. I had an "experience" once with a farm egg and I find it hard to really like eggs anymore. I won't go into details but ugh. It was nasty. The books you got look so interesting - both for different reasons but yet they really come full circle. What you grow you eat and what you eat can or cannot make you feel better :) Very neat. I can't wait to hear your reviews on both. Booo to the snow !!!! Elliott Coleman was the one I was trying to remember and I still can't find his book but I know I have it. So glad you found another one and I may have to get that one when I move back up North...it looks and sounds great. 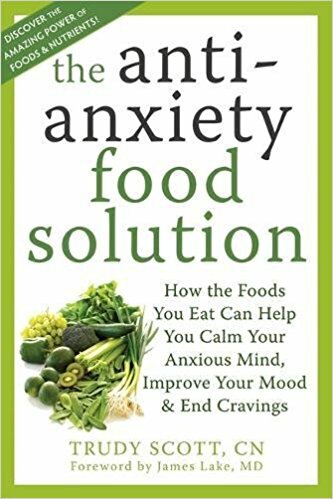 The anti-anxiety book concerning foods looks good for anyone to read! Your egg salad sandwiches are so cute with the pickle and olives and fancy toothpicks. I love egg salad...have you ever tried adding curry powder? It's the only way I eat it now....not too much as curry is strong but if you like that spice....in egg salad it is wonderful! Oh, I am going to have to try the Cheeze-its recipe for sure! Thank you! Today is meal day here and on my menu is chicken fried steak with mashed potatoes and a veggie....I can't wait! I've been cooking out of Pioneer Woman's cookbook which is wonderful but not necessarily healthy as I do not burn calories like a ranch hand! LOL! Have a great day and read a book about Haage.....the Danish art of happiness....they are the happiest people on the planet and they have learned how to be happy and celebrate the cold and snow! It's all about creating a cozy atmosphere...I do almost all of it but the entertaining part. I have strings of little lights all around my house, candles, melties in warmers for cozy smells (and to cover up any lingering animal odors...lol) and layers of handmade blankets etc. Have you ever thought of crocheting or knitting? It is very calming especially the knitting (until things go horrible wrong!). Crocheting really keeps my hands nimble from the RA and the knitting has been proven to calm and almost has a meditative effect along with a lowering of blood pressure (again, until things go horribly wrong! LOL!) Just sharing the things I taught myself when I was trying to heal both inside and out years ago. I took up knitting when I was quitting smoking as I needed something to do with my hands when I sat down to relax....it really did the trick! Have a great day and be "cozy"! Hi Mama Pea :)) The baking challenge was just an idea to bake something you've always wanted to try that seemed challenging...or revisiting a recipe you wanted to try again, like my Cheeze-It's!! If anyone wants to make the Cheeze-It's (if it's your cup of tea), I'd love to see how it turns out for everyone. Oooh strawberry shortcake! Now I'm envious...I love it! I make that quite often in the summer when we have nice strawberries at the market! I have to find a "U-Pick" farm close to here this summer for berries and tomatoes. I know Debra, it doesn't seem right lol! Hi Dianna :)) You reached 13??? How can we not be getting double digits??? It's the mountain weather. It's very sunny today but still below zero. I'm not looking forward to the snow this weekend! I like that you made the link between the gardening and the anxiety book, I never thought of it that way, but I was talking about gardening with my friend Nik the other day, we both think it feeds more than just the tummies, it feeds our minds and spirits too. So just reading about it calms me already. Since I'm hunkering down this weekend, I'll hopefully get a lot of reading done. When I was working, well, I was a workaholic, up at 4am and only home at 8pm, I never picked up a book, there was too much stress and I couldn't manage to read one sentence without immediately forgetting what I'd just read. My mind just couldn't relax. Even now I find that I have trouble, but the meditation is really helping with that a lot! Hi Sam :)) I read about your knitting challenges!! Actually I have some intense pain in the knuckles of both hands and I had to stop knitting because it made it worse for me, to the point where I couldn't hold a grip and dropped everything and anything. I tried crocheting last week, but got that same pain. I've given up needle crafts, though I do have my sewing machine. I don't have the set up currently, but I plan to have a craft/sewing room for myself in a few years time. I used to sew a lot. Right now my most favourite and relaxing hobby is painting. I love it! I just sketched a photo of our black and white husky Charlie, so she's the next watercolour on my list! I'd love to get to that today because it's sunny. I don't have good light in my office when it's dull out so I try to take advantage of sunny days to paint. 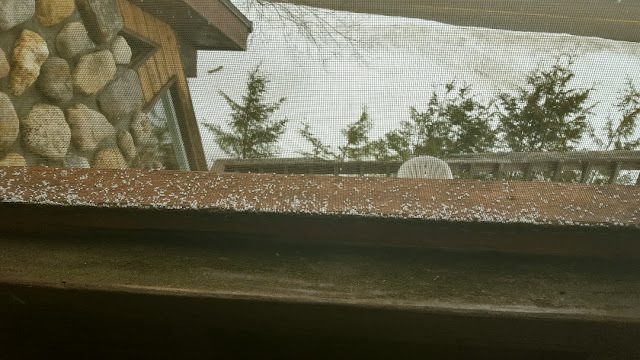 oh damn...you got more of my snow! why can't i get any? i hate it when it get warm here because i end up with 100's of noisy motorcycles in front of my house. noisy!